During a stop-and-search operation on Wednesday, 20 March, on the N2 (Ermelo road), two suspects were arrested for the illegal possession of dagga. 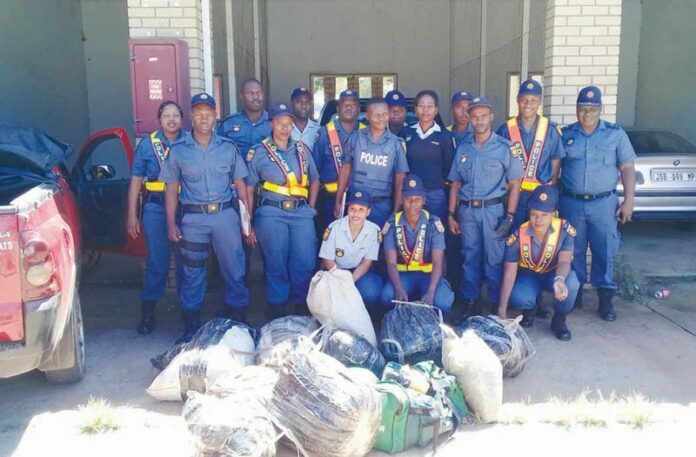 According to Colonel Blose, from the Mkhondo SAPS, the officials involved stopped and searched a red Opel Corsa bakkie and found 90,6 kg of dagga, hidden on the back of the bakkie. The two men were coming from Swaziland and were heading to Johannesburg when they were caught off guard. They were arrested on the scene. The vehicle and the dagga were seized. Well done to the following officials: Constables Lunga, Ndebele, Khumalo, Khaba, Sbeko, Mnisi, Ngema, Mgabhi, Mncube, Maake, Khoza, Dlongolo, Sbiya, Mavimbela and Warrant Officer Coka.